VoxMan» Blog Archive » Crescent Lake is Available! « FaffCon 3 is coming up! Actually, it has been for some time, but I haven’t mentioned it here just yet. Well, I’m rectifying THAT little oversight! This book was a LOT of fun to read. I truly enjoyed creating the characters and I hope you will enjoy hearing it. 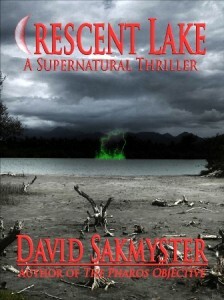 David Sakmyster is a very accomplished author and I’m proud to have been chosen as the voice for Crescent Lake. The novel is a horror thriller, featuring a main character trying to atone for the sins of his past faced with an evil beyond human imagining and an entire town that seems to be consumed by it. You can get a copy of Crescent Lake from Crossroad Press. As of the time of this writing, it’s on sale for a great price. If you do get a copy, I’d love to hear your thoughts on it. This entry was posted on Friday, September 9th, 2011 at 4:45 am and is filed under Uncategorized. You can follow any responses to this entry through the RSS 2.0 feed. Both comments and pings are currently closed.